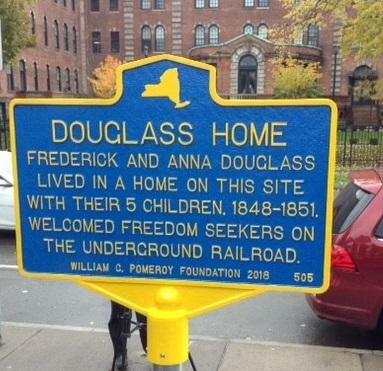 The home where Frederick Douglass first lived in Rochester is now being commemorated through a new historic marker. Officials from the city, the Pomeroy Foundation and relatives of the famous abolitionist gathered at the site at 297 Alexander Street for the dedication. It was in that home where he composed speeches and articles for nis North Star publication, and helped runaway slaves seeking freedom. Jacqueline Sprague and Katherine Sprague Dexter are relatives of Douglass' daughter Rosetta. They say it's a place where Frederick Douglass could spread his message, with other abolitionists, about the importance to eliminate slavery. "He used it not only for the Underground Railroad efforts, he would also use it for the purpose of having the abolitionists who worked with him to come and have meetings with him together, aid Jacqueline Sprague. "It's just such a proud moment, and it's for everyone. That's the key. It's not for the Sprague's, it's not for the people who are behind the cameras, it's for this whole community to join in and be joyful about this," said Katherine Sprague. Douglass and his family lived at the home at 297 Alexander Street for three years, but had to move to a more remote location after the passage of the 1850 Fugitive Slave act, which enacted tougher penalties on people who helped escaped slaves. The house was torn down in 1954 and is now a parking lot. An RIT professor and a library assistant researched the history of the site, and prepared an application for the Pomeroy Foundation, which in turn applied to the city for the permanent maker, and provided funding for it. Deryn Pomeroy says the site is an essential part of Rochester's history. "This is where they raised their children, where they hid freedom seekers on the Underground Railroad. Here in Rochester is where Frederick Douglass published papers, wrote articles, and gave speeches. It's where his influence continued to grow," she said.